5 Dark Chocolate Tasting Box - A perfect accompaniment to your coffee! Discover the amazingly individual flavours of the world’s great cacaos. Like fine coffee, each tastes remarkably different due to its genetics and geography. Cacoa beans are given a light roast to preserve their natural flavour characteristics and use the best cocoa butter and raw cane sugar, adding nothing, not even soya lecithin, so achieving the purest flavours. 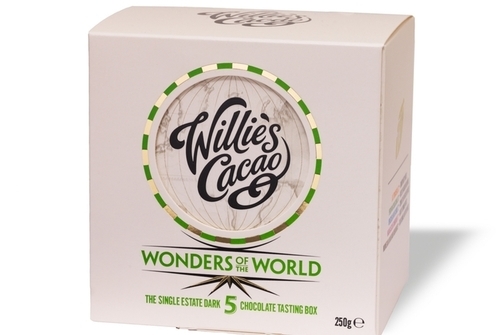 Includes a beautifully illustrated map of Willie’s Wondrous World of Cacao. "Melt into a World of Adventure"